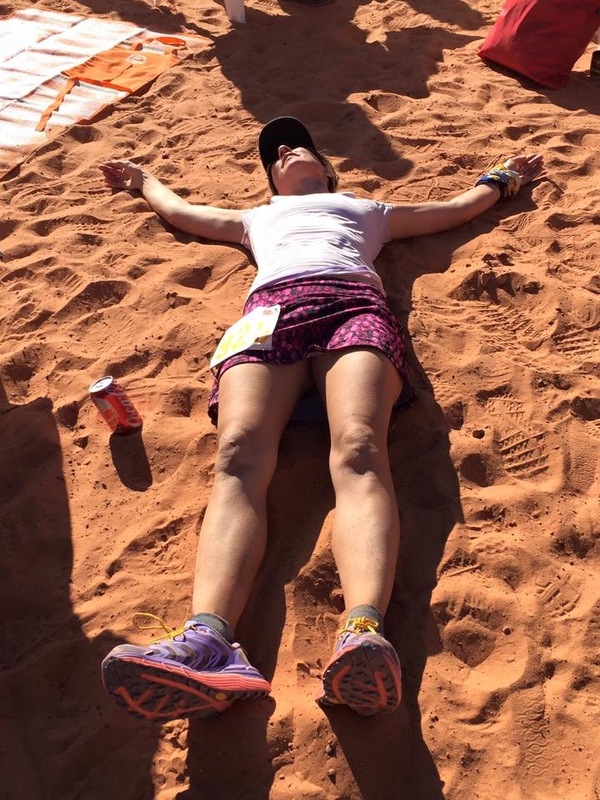 February 19: my first ultra of 2016, after a long winter without races. My last ultra of 2015, Franklin Mountain, ended in November, with a bloody knee, seven stitches, and a 15-mile lopsided death march to a mediocre finish. Redemption is on my mind as we line up in the chilly darkness of the Slickrock Amphitheatre just before 6 a.m. Also, apprehension. I will be 46 years old in a few months. Maybe it’s time to slow down. Maybe I should hang up my Hokas and take up quilting. But the Navajo blessing ceremony before the start is a beautiful way to chase away the worries and calm the mind. We will run 50 miles with beauty all around us. A day to celebrate. Matt Gunn, the brilliant mastermind behind UltraAdventures mind-blowing series of races, sends us off, with his final piece of advice: “Have fun out there!” Yes. I start out at a brisk pace, trying to get warm, before settling into a comfortable trot among the mid-pack runners who look fit but not superhuman. We make our way through a wide, sandy wash. No sense in going out to fast (duh! ), but no sense in wasting time either. I have never been on this course, so have no idea what my goal time should be. My goal is instead to leave everything I have on that course. I want to run every step except for steep or technical uphills, without stopping. The first slot canyon of the day swallows me at sunrise. It’s still dark and gloomy inside the narrow, winding track around the giant boulders with their swirly red streaks. Sand crunches under my feet. My headlamp throws long, dancing shadows ahead. A surreal experience. The path narrows even more. The canyon walls almost touch in places. I duck, once not low enough. The back of my head collides with the rocky overhang. Good thing my skull is thick. 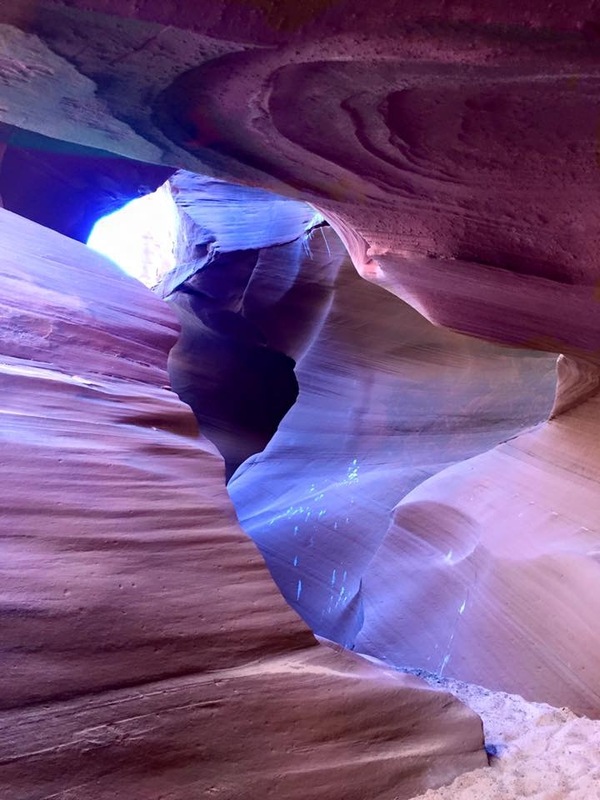 After a mesmerizing few minutes, the slot canyon spits us back out into the desert. We now run back through the same sandy wash that brought us here. 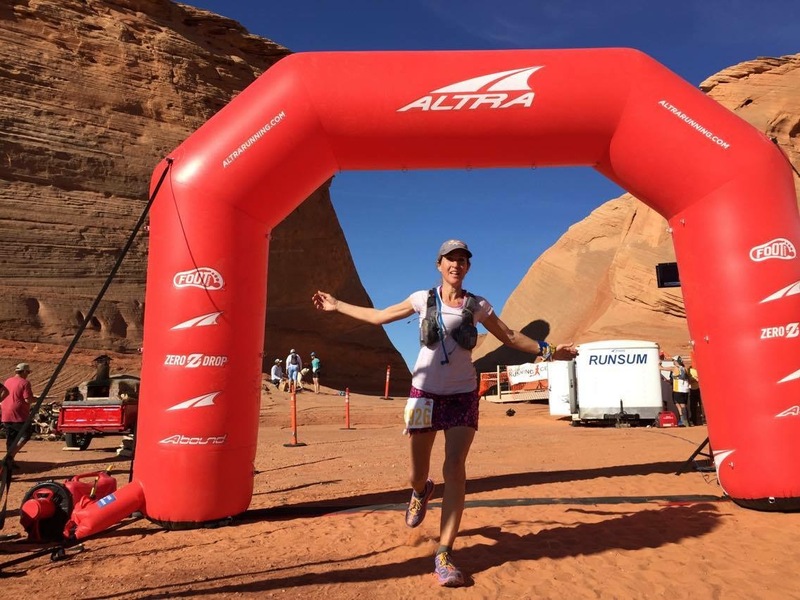 Groups of runners make their way into the surreal, shadowy world of red rocks. I cheer on everyone I know, and plenty of runners I don’t yet know. 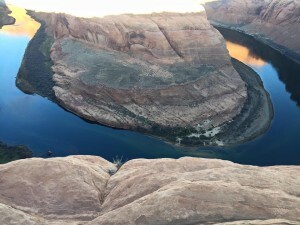 The next segment of the course takes us to Horseshoe Bend, an iconic landmark I know from calendars and post cards. To get there, we traverse a long stretch of hilly, deep sand. 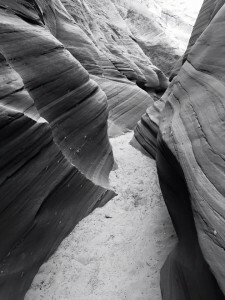 The slot canyon looked like it was on Mars, but this desert reminds me of Tatooine, Luke Skywalker’s home planet. I keep an eye out for droids or Jedis, but see none. Running on sand is one of my strengths. I pass a couple of other women and begin to wonder about my place in the field. From the out and back section, I know there are at least two females still ahead. They are probably half my age, but I still can’t let go of my competitive instinct. A girl in a black tank top appears in the distance. I sneak closer, then pass her with a friendly greeting and a burst of speed I might pay for later in the race. We cross a highway, then run up to the edge of Horseshoe Bend. The view takes my breath away.No pictures can do it justice. A short pause, a couple of pictures. Yes, I’m racing, but it would be criminal to not stop here. We make our way along the rim. Here, slickrock has replaced the sand. Not smooth slickrock, but jagged, pointy-edged, technical stuff. For me, unlike for most runners, this is a problem. Most of my winter miles have been on roads, and my last technical, rocky trail run ended in a bloody disaster, which means my trail confidence is zero right now. The scar on my knee starts throbbing as a reminder. I keep thinking how much it would hurt to fall onto this unforgiving surface. Franklin Mountain PTSD makes me slow down to a cautious shuffle. Adrian Stanciu, the shirtless wonder, catches up to me, then bounces out of sight like a sure-footed mountain goat. I stare after him enviously. The girl in the black tan top passes me next. I try to reel in my competitive instinct, to focus on running my own race, because I remember the reason for my Franklin Mountain fall: I was trying to catch up to someone else, running at their pace instead of mine. Not a good idea. A short, sandy stretch.I catch up to Black Tank Top, whose name turns out to be Johanna. For a while, we run together, engaged in pleasant conversation. Then, another rocky segment slows me down again. Johanna surges ahead, out of sight. Grrrrrr. My competitive instinct roars. I calm it down, with soothing words about my advanced age and the need for self-preservation. And then, we enter another beautiful slot canyon. Time to savor the scenery, time to enjoy the here and now, not time to worry about competition. 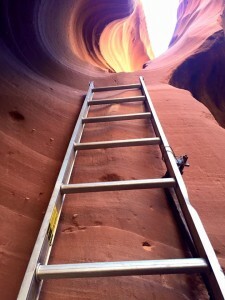 Also, time to climb wobbly ladders, which takes concentration. We cross the road again, approaching the next aid station. Johanna is inside the tent. The Zen moment has passed. My competitive instinct rears its ugly head. I chug some Coke, remember to tear open a Stinger Waffle, and exit in record time, ahead of the young whippersnapper in the black tank top. More sandy double track. The sun is high in the sky, and it’s getting warm. Hot, even. After a snowy, freezing winter in the mountains of Northern New Mexico, I welcome the heat. Besides, the specter of Johanna in hot pursuit propels me forward, past other runners, most of them wearing the green 55k numbers. The next aid station. My socks have so much sand in them that it feels like I’m wearing weights on my soles. Not good. I sit down and waste a precious couple of minutes dumping it out. George from Team Nuun recognizes my temp tattoo. We say a hurried hello, then I run on. I still feel strong on the sand, can still run on it, and pass more struggling, demoralized runners. A long uphill. I powerhike it, still passing people. Run again. I picture Johanna right behind me. Another aid station. 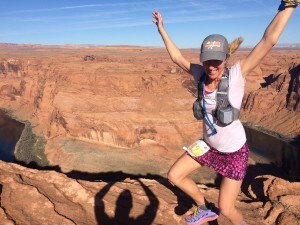 My friend Britta, fellow German and fellow Ultra Adventures ambassador, is in charge. A quick hug. More ginger, another Stinger Waffle. My stomach is happy. I am happy. It’s impossible to be anything else today in this gorgeous part of the Southwest. The last part of the course. 12 miles or so on a loop trail close to the town of Page. Packed dirt, smooth, runnable. I can still run, so I run, even the uphills. Miles tick by. I pass people walking, I pass people shuffling along. A short out and back section to the last aid station. I don’t see Johanna, which means she is more than five minutes behind me. She could still catch me, though. It’s getting hot. The last few miles of the course are also the least scenic: residential areas, a golf course, road crossings. My energy plummets. I dig for my last reserves. No walking the level parts, or the downhills. Or the gentle uphills. I slow down, but I keep running. The last aid station. 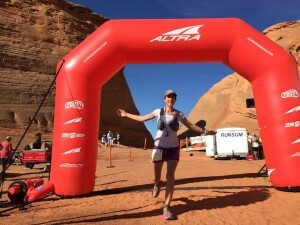 Less than a mile to go, down the hill, across the parking lot, and up a metal chute that leads to the finish line inside the Slickrock Amphitheater. One last burst of energy. 9:17, good for second place. Time to hug my husband (who got lost on the 55k course, but took hundreds of pictures). Time to congratulate my three teenage students, who finished the half marathon. Time to hang out, to reconnect with friends, to enjoy the afterglow of a perfect day. But maybe it is not yet time to hang up my Hokas. Thank you, thank you, thank you Matt, Tana, Turd’l and everyone else who makes UltraAdventures races such class acts. I look forward to seeing you next month in Monument Valley! This entry was posted in Uncategorized on February 27, 2016 by silvakat. Congrats on second place! That’s a great start to 2016! Thanks, Tina! I love running ultras no matter where I finish. That said, placing top five is like extra icing on an already yummy cake. It was great seeing you and to exchange a couple of words on your aid station fly-by! Congrats on the second place!! See you at Monument…. You are smoking fast!! That was so tough!!!!!!!!!!!!!!!!!!!!!!!!! Hi, Katrin. What a fabulous place to start this racing season. Enjoyed your account of your race. I’ve been patiently waiting for Gail to sign up for this one. Speaking of Gail, I think she would take exception to your classifying yourself as old. Look to her and Kathy for inspiration when that thought crosses your mind. On another note, will you take a look at the blog I’ve started? http://www.pointsofmycompass.org. I’d appreciate your thoughts.